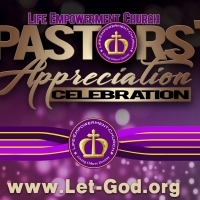 Pastors' Appreciation Service is an opportunity for us to celebrate and bless our Pastors, Marcus and LaTerra Ruffin, for the outstanding work that they had done! There is a lot of work to overseeing a church and taking care of God's people. The list is endless and the work is enormous, but they continue to faithfully show up and complete an outstanding job! This is an opportunity for the church, community, family, and friends to come and celebrate and hear the wonderful things that they have done. There will be a guest speaker, Pastor Danny Johnson, Zion Christian Center, Roxboro, North Carolina! Pastor Johnson who will be ministering and honoring the work that Pastors' Ruffin have done at Life Empowerment Church and the community. We invite and encourage you to come and be a part of this extravaganza! Join us on Friday, March 1, 2018 at 7:00 pm. This is a one day celebration and a small token in comparison to what they offer us and the community. There will be no childcare for this service.